Our gracious hosts - Ed Shephard and Gary Noce with their girls, Kasey and JoJo. 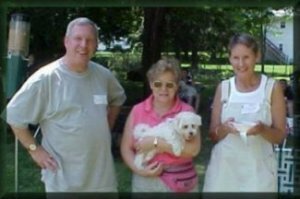 David Bogner, Maryann Murfin and Maryann Bogner (holding Princess 10 week old puppy owned by Robbin Dibble). 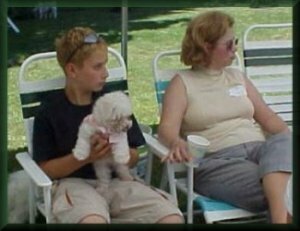 All are waiting for their own Bichon to bring next year. with Tigger and Little One. 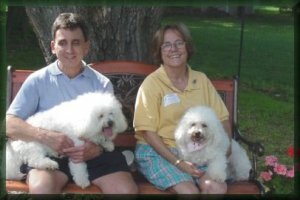 Ellen has attended all four Bichon Bashes held in Binghamton. 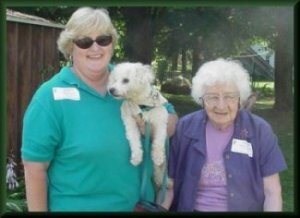 Pat Kimmel with her mom, Madeline Kimmel and one of the three Bichons that Pat brought with her from Connecticut. 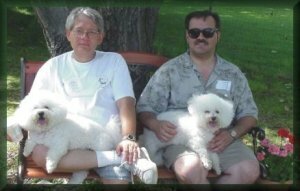 Geoff and Mary Ogden from Barneveld, New York. Geoff is holding Princess. 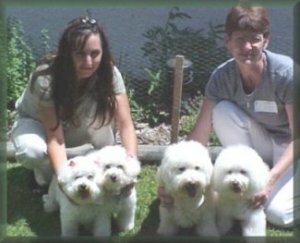 Rebecca Handley (from Wilkes Barre, Pennsylvania) and Sally Flynn (Dallas, Pennsylvania) with four fluffs.